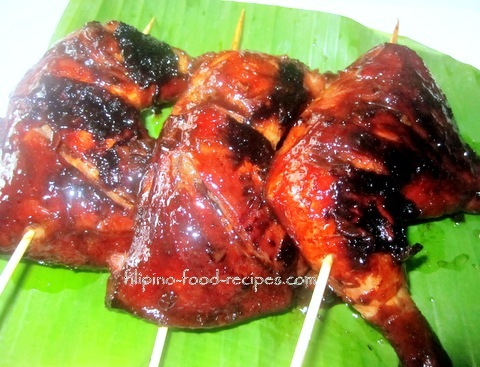 Filipino Chicken Barbecue is a great dish but a bit underrated because it is seldom seen in parties and celebrations -- probably because it is not as easy to cook as the thin pieces of pork on the stick we Pinoys call barbecue. 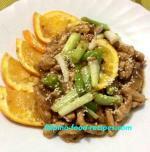 To make this dish, we make a marinade of lemon-lime soda with soy sauce and garlic and grill over charcoal. Simple, isn't it? Not quite! This is the one dish that is often mistakenly cooked quickly -- with a nice, charred, sticky, crispy skin but with the inside undercooked and still 'bloody'... definitely UNSAFE to eat. We attended a barbecue party last summer, I was drooling over the chicken barbecue - the smell and the grill marks on them tells me they were worth coming to the party. They would have been the best food that night but they were raw -- and eating those could have been severely tragic -- (not being melodramatic, but think diarrhea, abdominal cramps, or salmonella!). Unlike the Filipino barbecue pork which we can quickly sear on the grill, whole chicken thighs or even just the chicken legs could appear cooked but the inside could still be raw. Grilling chicken is not as easy as many thinks. The inside has to be fully cooked for it to be safe to eat, at least 165°F. The problem with this sweet marinade, the outside gets caramelized easily and you would think it's already cooked. I suggest to set 2 spots on the grill, one side with charcoal or heat, the other one without. Caramelize the chicken on the hot spot, then move them to cooler spot, close the lid with the vent open and let the chicken bake (yes, bake since they are not directly over the hot coal) for at least 30-40 minutes or until the thermometer reaches 165°F. Or if you want them cooked rather quickly -- debone then slice the chicken fillets thinly and in bite size pieces and skewer, just like the Filipino pork barbecue. 1 Combine all the marinating ingredients together. 2 Reserve 1/2 cup of the marinade for the basting sauce. 3 Add the chicken pieces in the marinade and refrigerate overnight. 4 Set up the charcoal on the grill just on one side and have the other half side without any charcoal. 5 Baste the chicken pieces and grill for 2 to 3 minutes per side on the hotter part of the grill, then transfer to the cooler side closing the grill lid for the chicken to cook through, about 30 - 35 minutes (internal temperature of at least 165 deg F). 6 Serve as it is or with a vinegar dipping sauce.